If you were to walk into an Aussie bookstore or library, you would find the shelves groaning under the weight of novels from abroad, particularly the US. We too were swept up in the Harry Potter, Twilight and The Hunger Games Series’. We have grown accustomed to international slang and even spelling if the novel has been ordered from overseas (note there has been a lot of robust discussion around parallel imports in Australia, but that is another blog post altogether!). And we Aussies are actively engaging with international readers and writers through social networking sites like Twitter and Goodreads. There is no doubt in my mind that the young adult scene is going global in Australia. There also seems to be an ever-emerging trend for Aussie authors to not mention the name of towns or cities in young adult fiction, particularly for those novels in urban settings. For example, the very successful The Violet Eden Chapters by Aussie author Jessica Shirvington is set in a location referred to simply as the City. Of course, having a non-descript setting makes translation easier, as it removes the use of slang and, as Shirvington explains in this interview with Chapter-by-Chapter, it allows the readers to choose their own setting. This has certainly worked for The Violet Eden Chapters, which has been picked up for a TV series to be produced by Steven Spielberg! But in the interview, Shirvington also explains an identity crisis familiar to many Aussies. A large number of us are only first generation Aussies and it seems like every second person has dual citizenship or has lived in another country for a year or two. For example, my father is an Austrian who lives in the US with my half-sister, who is American, and my maternal grandfather was a Pommy (our tongue-in-cheek term for the English), which means I am basically a mongrel or a bitzer (made up of bits of everything)! With this being said and done, many of the young adult books I grew up with were very Australian. The defining novel has to be Tomorrow When the War Began (and its six follow-up books) by John Marsden. The series starts with a group of friends who go out camping in the bush for a week, only to return home to discover an unnamed army has invaded Australia. The novels are addictive, but I wonder whether non-Aussie readers would struggle with the vernacular, e.g. 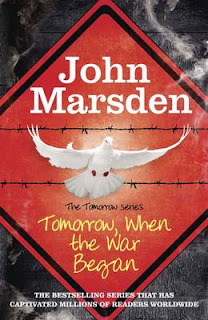 I have previously read that Marsden turned down a number of movie deals that would have seen the series reset in US. The first book was finally made into a movie a couple of years ago and while it debuted at number one at the box office in Australia, it only made under three million in the rest of the world. And yes, there have been many online discussions around its similarities to the upcoming remake of Red Dawn, which ironically stars Aussie actors Chris Hemsworth and Isabel Lucas. 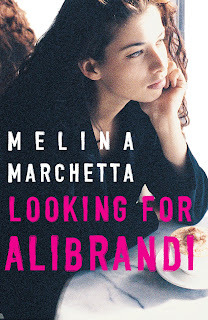 Looking for Alibrandi by Melina Marchetta was another young adult novel of my generation. "Oh, Jozzie, Jozzie. Look at your hair. Why, Jozzie? Why can you not look tidy?" My grandmother says that to me every afternoon. She says it with a painful cry in her voice as if she is dying. I'm not sure if anyone has ever died of the fact that their granddaughter looks untidy, but I'm sure my grandmother will one day because she'll strain her voice so much she'll choke. I loved this novel and its film adaption remains the most financially successful Aussie teen movie to date. I was lucky enough to hear the author speak at a festival the other week. After a series of very Australian novels, including Saving Francesca and On the Jellicoe Road, she is now focused on a fantasy series, the Lumatere Chronicles, which have a setting that is distinctly European. Again, I think it is an example of how universal we have become in Australia. While many thought we were busy riding kangaroos and wrestling crocodiles, we have become wordly. My sister and I barely notice the gap between our cultures anymore, although she took on the informal role as translator for my upcoming young adult novel When the World was Flat (and we were in love), which is set in a fictional town in the US: bomb cars became crappy cars; mollycoddled became babied; and crop top became training bra. · Graffiti Moon by Cath Crowley, which won the most recent young adult Prime Minister’s Literary Award in Australia. · Sleeping Dogs by Sonya Harnett, which I discussed on a literature panel about ratings for books. It is THAT controversial! And for those interested in young adult science fiction and fantasy, I can highly recommend ANYTHING by Victor Kelleher, including Taronga and the Parkland Series. His books fuelled my love of reading and writing, especially his childrens’ book Brother Night. There is also great list on Goodreads of the Best Australian Young Adult Books.